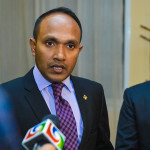 A committee has approved changes to the People’s Majlis standing orders to offer the vice president just 30 minutes to respond to an impeachment motion, and proposed changes to fast-track the process of voting on a nominee to fill a vacancy in the vice president’s post. 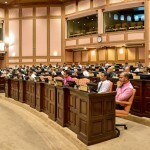 A committee has approved changes to the People’s Majlis standing orders to offer the vice president just 30 minutes to respond to an impeachment motion, and proposed changes to fast-track the process of voting on a new vice presidential nominee. The standing orders did not previously specify a time period for the impeachment debate. 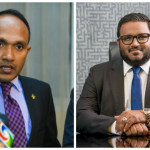 The ruling Progressive Party of the Maldives (PPM) is seeking to remove vice president Dr Mohamed Jameel Ahmed and replace him with tourism minister Ahmed Adeeb. A motion to impeach Jameel is likely to be included in the agenda for Monday’s sitting of the People’s Majlis. Jameel is currently in London. He is yet to respond to PPM MPs’ charges of incompetency and disloyalty. Explaining the change to the response period for impeachment, PPM MP Ali Arif, who chairs the general affairs committee, told CNM that the vice president will now have 10 minutes to make an opening statement, 10 minutes to respond during the debate, and 10 minutes to make a closing statement. MPs will have an hour and half to debate the motion. Arif said the changes were approved today with the backing of opposition Maldivian Democratic Party (MDP) and Jumhooree Party (JP) MPs on the committee. Since the committee has the authority to determine time periods for agenda items, the changes will not have to be put to a vote on the floor. The general affairs committee also approved changes to the rules today to fast-track the process of voting on a president’s nominee to fill a vacancy in the vice president’s post. PPM MPs have said Adeeb will be sworn in as the new vice president by July 26, the golden jubilee of independence from the British. The rules were changed to allow the speaker to call for a vote on the day a committee’s evaluation report is sent to MPs. Items are normally tabled in the agenda three days after the committee report is sent out. 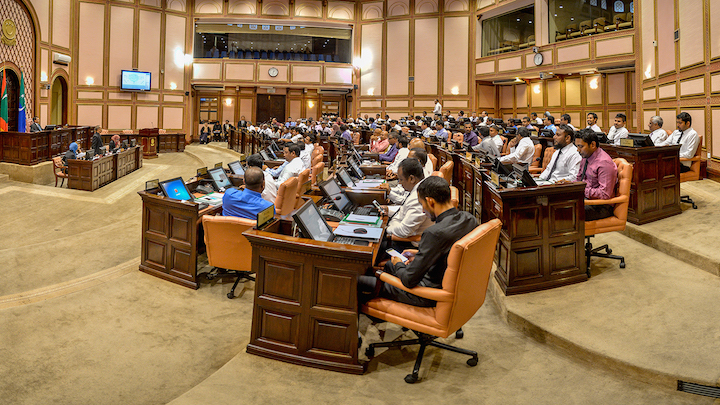 The changes will have to be put to a vote on the Majlis floor. In June, the parliament also amended its standing orders to fast-track the vice president’s impeachment process. Under the new rules, the parliament can vote on an impeachment motion in the vice president without an investigation. A two-third majority or 57 votes will be needed to remove the vice president. The ruling coalition has 48 seats in the 85-member house, but appears to have secured the backing of opposition MPs to pass the motion, which was submitted with 61 signatures. 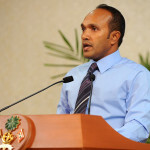 Jameel has labeled his imminent impeachment a “constitutional coup” and called for the international community to intervene. In response, Adeeb accused Jameel of plotting a coup d’etat with the opposition. President Yameen is meanwhile yet to publicly comment either on the vice president’s impeachment or a favoured candidate for the post. In a meeting with the PPM parliamentary group last week, Yameen reportedly showed MPs proof of Jameel’s correspondence with opposition politicians ahead of a mass anti-government protest on May 1. In the messages, Jameel reportedly asked if the opposition will let him assume the presidency if Yameen is ousted. The opposition says Yameen wants to replace Jameel because he is fatally ill and is seeking a more loyal deputy ahead of a major surgery. A constitutional amendment was also passed with overwhelming multi-party consensus to set new age limits of 30-65 years for the presidency and vice-presidency. The opposition’s backing for the amendment was widely perceived to be a deal made in exchange for jailed ex-president Mohamed Nasheed’s transfer to house arrest. 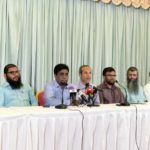 The government and Nasheed’s Maldivian Democratic Party are currently engaged in talks to resolve a six-month long political crisis.